In Us, Adelaide Wilson (Lupita Nyong’o, Madison Curry, Ashley Mckoy) gets lost in a carnival funhouse when she is little and encounters a girl in one of the mirrors who looks just like her, but evil. For years afterward, she struggles with PTSD and the feeling that the other girl is always out there, waiting to find her again. Years later, when visiting the family beach house with her family–husband Gabe (Winston Duke), daughter Zora (Shahadi Wright Joseph), and son Jason (Evan Alex)–she starts to notice an increasing number of coincidences. While at the beach with family friends Kitty (Elizabeth Moss) and Josh (Tim Heidecker), Jason goes missing for just long enough to majorly set off Adelaide’s anxiety, but before the family can vacate the beach house, her shadow and her shadow’s family show up, wanting to “untether” themselves and get their chance to live a life out of the shadows. Their arrival starts a night of violence and mayhem that the Wilsons have to stick together to survive. After his breakout horror hit, Get Out, expectations were high for Jordan Peele’s second horror flick. 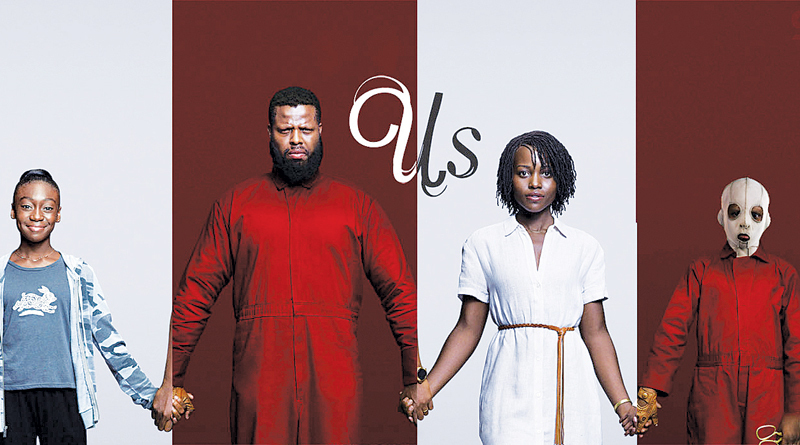 Although Us is an exceptionally well-made film and definitely thrills, unlike with Get Out, in Us I felt like I could see Peele’s work and his influences, but not all the figures added up as they should have. Especially at the film’s end, there were some moments that did not land like they were expected to. I was left feeling impressed by the technical aspects of the film, but not emotionally attached to the result. Those technical aspects that standout are the structure of the story, the acting, and the blend of horror and humor. In terms of the screenplay, Peele does an artful job of moving between two timelines and setting up emotional punches that will hit later on. Aside from an opening sequence in which a bunch of caged rabbits basically earn their SAG cards, the story is also well-paced and moves through each act with periods of humor, suspense, and horror. The script is also laced with Peele’s trademark wit, but when the ending twist is revealed, his cleverness does not totally succeed in making the result believable. Nevertheless, Peele has a lot of fun with horror conventions and some of the best comedic moments come from characters lacking genre savvy. The acting is awesome. Each actor plays both their primary character and the shadow version of that character and the stark contrasts enable them to show off some real range. Winston Duke is funny and charming as Gabe, but the real stars are Lupita Nyong’o and Elizabeth Moss. Nyong’o is always excellent and it was fun to see her in a horror movie. Elizabeth Moss’s Kitty is low-key obnoxious, but her scenes as Kitty’s shadow are spectacularly unnerving and dark. Although once they make sense they take on more importance, I wish that the rabbits and the connection to Hands Across America carried more oomph. They seem a bit extraneous, however, and it is that lack of tightness that differentiates Us from Get Out. It is still an excellent film, however, and will keep audiences talking. I rate it 4 of 5 stars. Us was written and directed by Jordan Peele. It runs 1 hour and 56 minutes and is rated R for violence/terror, and language. Streaming on HBO Go and Sunday nights on HBO, The Case Against Adnan Syed re-examines the murder case made famous by the hit podcast Serial. In the case, Baltimore teenager Adnan Syed is convicted of killing his ex-girlfriend Hae Min Lee, but after twenty years in prison, his legal team, motivated by family friend and attorney Rabia Chaudry is still fighting to overturn his conviction, which they believe to be faulty. Although those who already have strong opinions about Syed’s guilt or innocence are not likely to be swayed, for those who have not followed the spin-off podcasts and books about the case since Serial, The Case Against Adnan offers a lot of new information. For those who have, myself included, it is fascinating to see people who up to this point have just been voices. The series also invests more time in Hae Min Lee than previous productions about the case, bringing her more to life and building more sympathy and understanding around her as a person. ON the whole, the series so far has been compelling and informative. I recommend checking it out, even if you did not listen to Serial. The Case Against Adnan Syed was directed by Amy Berg and runs four episodes, approximately an hour each.